Ack. This is strange! I’m a web editor by day and I’m an enthusiastic beginner sewist (stitcher? sewer?) by night. I’ve just recently got back into sewing again after getting inspired by all the amazing sewing blogs out there like Tilly and the Buttons, Elegant Musings, A Fashionable Stitch… I could go on but I’ll just link to them all anyway once I work out how to use WordPress. My mum bought me my first sewing machine about 10 years ago. I think it cost about £50 from Lidl at the time, but it lasted right up to this year. Then she bought me my second sewing machine for my birthday (I moved up in the world to John Lewis and my very own Singer, which I love love love) – thanks Mum. Note – 10 years still makes me a beginner because I’ve had a long time out from sewing… and I’ve not actually got any better… well maybe a bit. I’ve learned a few techniques like piping, bias binding and some rudimentary quilting (I can make a mean envelope cushion you know). But I have yet to put a buttonhole in (I’m frightened) and my zips are pretty rubbish (I’m clumsy). So pull-over-the-head tops and dresses have been the peak of my sewing prowess so far. c) give me an opportunity to introduce Keef ‘n’ Gracie. Who are Keef ‘n’ Gracie? They’re my cats. Brother and sister, named after Keith Richards and Gracie Fields*. They’re hot. I’ll introduce you to them soon. They’re not big fans of sewing as it means they get shoved off the kitchen table. They just love to saunter over patterns you know. I’m surprised I’ve not accidentally snipped a paw off yet. *Not really Gracie Fields – I just liked the name and I haven’t got any kids yet. I sometimes worry that I’m dropping neatly into a cliche – crafty, has cats, like retro stuff… doof – I don’t care – it’s all true! 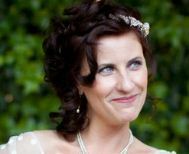 Oh yeh – my name is Joanne and that picture is of me on my wedding day earlier this year. Readers, I’m still married to him. Hi Joanne Roseleen here,Des’s mum.He sent me you blog,very good I liked your chairs and seat pads.I hope you keep it up and look forward to getting some tips all the best Roseleen xxxx. Awh Rosaleen thanks very much! Um I think you’ll be the one leaving tips though hehehe! Thanks very much for checking it out though – see Des does listen to me sometimes! I have just found your site via Dolly Clackett! I love it – the bird print dress is just fabulous!! Ah thanks Charlotte! Will check yours out! Thanks so much for dropping by Jude and thank you for kind words. Hope you get more time to create beautiful clothes!